The weather has turned chilly here and I’ve started to make soup. I love soup. It is one of those things that tastes like it took way more effort to make than it actually did. It freezes well so you can make a large batch to keep some for later when you can’t be bothered cooking. 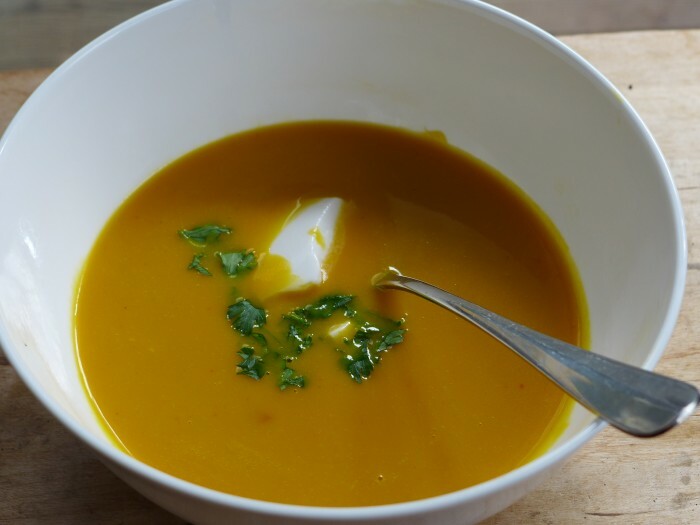 I made this creamy thai flavoured sweet potato and carrot soup last week and ate it all promptly for both lunch and dinner, so I made it again the next day. Just a few ingredients and 30 minutes is all it takes. I made it completely velvety by using a high speed blender to puree it, but if don’t have one it will work with a food processor, stick blender or a masher. It will just be a bit more rustic. I served mine garnished with some coconut yoghurt, coriander and kaffir lime leaves. Standby for at least a month of my favourite soup recipes! It is definitely the weather for it. Add the sweet potatoes, carrots and water and bring to the boil. Reduce the heat and simmer until the vegetables are tender, around 30 minutes. Tip the entire contents into a blender and whizz until completely smooth, or puree with a stick blender or masher. That looks silky smooth! Very nice. Yes, it is incredibly smooth. I’m really impressed by the sheer power of a high speed blender!